Christmas! A time of Peace, Joy & Goodwill Toward All. A time of giving. A time of sharing. What a blessed season! Three examples of the best and worst of Christmas giving were evident to me this year and all worth sharing, I think. One family, a very well-to-do family I might add, has always limited the gifts received by their pre-teen children to only three gifts each. This year the children were given the option of the normal three gifts each or of two gifts each and using the value of the third gift to give to a charity of their choice. The two children chose to take only two gifts and give the value of their third gift to those less fortunate. The youngest gave to a group that shelters animals. The oldest split his gift between the Red Cross and the Salvation Army, as I understood it. These children, the youngest girl in particular, desperately wanted a puppy for Christmas. The parents had already decided that if they chose to share, then they would get the children a new puppy, otherwise, it would be just the three gifts. Happy, so happy were the children when they learned that they had a new puppy and of the reasoning behind their receiving this gift. A major gift from grandparents since these children's births have been contributions to their college funds. In another family, an anything but well-to-do family, a precious and precocious three year old received a laptop computer. The reasoning? The child was fasinated by computers and would play with one without interuption for three hours and then react badly when forced to stop to eat or go to bed. Yes, a computer was expensive but what a great way to control a three year old so the gifting grandmother said. That household was filled with a large number of mostly preteen children who had each received a number of gifts. All received electronic toys. The observation was made by the head-of-the-household about what a "great" idea the electronic toys were. The observation was further made that the kids, who were sharing a crowded room were quiet, peaceful and fully occupied for hours, just staring at the toy and working their thumbs. College fund? To go to college one must graduate from high school, which one child out of the many has done and she is now well along toward becoming a nurse. She is the exception. TO MY WAY OF THINKING, THIS WAS THE WORST. Do I have "STINKING THINKING"? Maybe. It is for certain that my thinking is an out-of-date one with a large, probably a majority, of todays families. I must admit the electronic ability of today's children far exceed that of my generation, or of their parents generation for that matter. My 10-year-old grandson instantly set the time on my Ironman watch that I hadn't used since I had to quit running at age 72 because of a bum knee. He understands the televison controls better than his extremely well educated and computer literate mother. I am convinced, however, that there should be far more to life than electronics. I also know that life changes. Today, for the first time, there were more electronic books sold than hard print books. People do read but less and less so. Shopping has changed. Discussing Sarah Palin's "Going Rogue", my youngest son bought it on his kindel in less than two minutes. He also bought it for $9.00. I paid $17.00 at Sams Warehouse Club. As impressive as that is, I still prefer my book. My son's small church has as one of their church guides that 10% of all income will be used to help people. Twenty-nine folks from this church distributed $2,000 in gifts to four families that The Salvation Army identified as being in dire need. A volumn of food, toys, clothing, even a table and chairs refinished by one member for a couple who literally did not have a table on which to eat, was bestowed upon these four families. The church folk greeted, sang songs and, as requested, had prayer with those in need. IS THIS GOOD OR WHAT? Now say that real fast ten times! 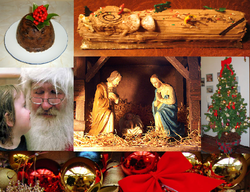 Enjoyed this blog, Dad, and was pleased and humbled to be cited as one of Christmas's "best". Love you!